This article originally appeared in the March 2010 issue of The Chimney Sweep News (SNEWS). The Chimney Sweep News is an independent trade journal for chimney and hearth service professionals. Subscriptions to The Chimney Sweep News are available by calling 541-882-5196. Chris Neufeld, Vice President of Blaze King, presented this information to the EPA at recent hearings and to hearth industry experts at the Renewable Energy Conference in Salem, Oregon in April 2009. In the late 1970s the first combustors were added to woodstoves. Early attempts were crude and were the result of simply cutting a hole out of the baffle of a woodstove and inserting a combustor. In later trials, the combustor was relocated above the baffle plate and some improvement in both function and longevity was observed. The main combustor provider at the time was Corning Corporation (although design, testing and coating were handled by Sud Chemie) and the earliest manufacturers included Consolidated Dutchwest. Stove manufacturers learned that the location of the combustor was not just critical to how the stove functioned, but also how long a combustor would last. Flame impingement – flame hitting directly in the face of the combustor – and over drafting resulting in excessive temperatures are only two of many things that can destroy a combustor, which are detailed later. Service calls for replacing combustors became all too frequent and while specialty hearth retailers may be short on vacation time, they are not short on memory space, especially bad memories. Many stove manufacturers gave up on promising catalytic technology in favor of designing clean burning non-catalytic woodstoves. Since the introduction of catalytic technology, research and development by manufacturers has lead to improved performance and extended life spans. These investments are paying positive dividends in the newest generation of catalytic woodstoves. Improved structural integrity provides greater resistance to chemical attack, cracking and consumer negligence. During the burning of cordwood, minerals in the wood such as potassium are released. At elevated temperatures, potassium becomes molten and attacked the glassy phase cordierite based catalyst substrate of some early combustors, leading to crumbling of the substrate and structural failure. Combustor failure: crumbling substrate, coated with creosote. The original mullite ceramic substrates resisted potassium attack and were “state of the art.” When cordierite substrates were introduced to the market, problems arose due to the potassium attack brought on by poor stove design and combustor location. Some vendors tried to duplicate the original mullite with partial success. One leading supplier has even introduced a fully brazed, stainless steel substrate as a replacement combustor in response to a leading stove manufacturer’s poor design. Wall thickness of the stainless substrate is far less than that or other substrates, allowing for more overall surface area or facing. Thinner wall dimensions allow the combustor to come up to temperature more quickly and therefore become active quicker, burning gases and vapors. The stainless substrate can tolerate the higher temperatures. Although there were early failures of combustors in woodstoves, clearly the biggest contributor to these failures was the design of the woodstoves themselves. Direct flame impingement and excessive temperatures lead to these failures. By contrast, a well engineered catalytic woodstove makes nearly all substrate materials viable. With the advancements made in catalytic technology and improved stove design, the dependability of combustor lifespan has increased for all substrates. This extended lifespan is also due to better education programs for catalytic woodstove owners. Then as today, proven substrate materials include mullite, cordierite and stainless steel. One vital aspect of combustor success is surface area. While most of us have seen the more common round, square, oval and rectangular combustors, there have also been a number of more unique designs. The more successful catalytic stove manufacturers have found square cell design with a total of 16-25 cells per inch to perform reliably. There are of course a myriad of shapes and cell densities. It is noteworthy that each catalytic woodstove needs to be designed from the ground up around the combustor. Manufacturers who design woodstoves and then try to install a combustor generally find their products ill-suited to combustor design and face a litany of problems. A combustor is a substrate consisting of materials previously mentioned with a wash coat of catalyst applied. Combustor substrate is coated with an oxidation catalyst, usually palladium or platinum. During the initial firing of a catalytic woodstove, a by-pass, designed in the stove to allow gases to exit the stove without being forced through a combustor, is left in the open position. The actual amount of time required for a combustor to become active varies based on stove design and combustor design. The total start-up time is based on thermal mass and conductivity of the substrate. As a rule of thumb, stainless steel combustors, which have thinner cell walls, become active more quickly and require less by-pass time. After the by-pass mechanism is closed, smoke and gases are forced through the combustor. Combustible gases in wood smoke are ignited as they pass through the cells of a catalytic combustor. Wood smoke requires high temperatures to be consumed and there is a great deal of energy to be harvested in wood smoke. An active combustor greatly reduces and concentrates the temperatures needed to process and harvest wood smoke gases. This is a critical point. In some non-catalytic wood stoves, very high temperatures are used and larger amounts of steel or stainless steel components are exposed to this excessive heat. Over time, much like a combustor, these steel components may require replacement to keep the stove functioning correctly and to keep it within EPA emission requirements for non-catalytic stoves. Most manufacturers design these parts, like the combustors, to be removed for replacement when needed. As the gases pass through a combustor, the active temperature and total surface area burn these gases and return them as energy to heat the given living area. Most gases commonly considered to be harmful to the environment are burned within the combustor. Note how each of the gases in the illustration are burned at various degrees. Most encouraging is that a catalytic woodstove can in fact remove up to 65% of methane gases, something non-catalytic stoves have not established. The chart below is based on 40K BTUs. Properly functioning catalytic combustors destroy a large percentage of air toxics emitted during the combustion of wood. Combustors can destroy up to 90% of the creosote associated with wood combustion and remove 90% or more of the harmful pollutants found in wood smoke. What a combustor can not do is tolerate ongoing or constant misuse or abuse. Catalytic wood stove manufacturers should always encourage stove purchasers to burn only well seasoned cord wood. Wet or green wood should not ever be burned in any wood stove, regardless of design. Affordable moisture meters are accurate enough to educate consumers as to the moisture content of the fuel they wish to burn. Although a combustor can process gases and chemicals such as formaldehyde, building materials, printed materials and other items with glues, adhesives and metals should not be burned in any stove. Unfortunately, repeated burning of such materials results in the release of these agents which can then over-plate or fill up the pores and surface areas of the catalyst coated combustor; eventually leading to the combustor becoming plugged. These are not proven to be destroyed in the combustion of a non-catalytic stove and go up the stack. To be certain, any individual who burns materials other than recognized fuels, i.e. cordwood or approved manufactured logs, in a catalytic wood stove for any period of time can shorten the lifespan of the combustor. These folks are quick to learn about proper burn techniques, especially since their stove will not function as well as when first purchased. Essentially, catalytic woodstoves discourage individuals from burning anything other than good quality fuel. Today when individuals purchase a catalytic woodstove they know about the level of commitment they will have to make to their burn habits, use and maintenance. Catalytic woodstove purchasers invest more money in a catalytic woodstove so as to receive maximum efficiency and clean burning, just as owners of quality made, more costly vehicles tend to take better care of their vehicles. Today, catalytic woodstove owners know it is far less costly to replace a combustor than it is to purchase an additional 10-30% more cordwood each year. Recently, Applied Ceramics, a leading combustor manufacturer, performed a comparison of the performance at different burn rates of various stove designs. We were told by Applied Ceramics that various manufacturers were contacted by Applied Ceramics and asked to supply burn data for their products. Understandably, not all stove manufacturers wished to participate in this analysis. However, data provided by both catalytic woodstove and non-catalytic woodstove manufacturers was used to create the following performance chart. As you can see, in the burn rate where most woodstoves spend the greatest amount of their life time, the catalytic woodstoves had exceptional performance numbers. 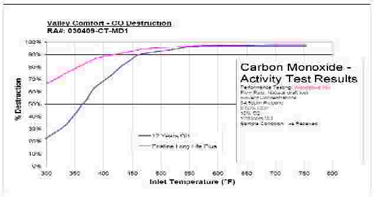 Catalytic combustor equipped woodstoves perform especially well at low burn rates. There have been some poorly designed stoves, both catalytic and non-catalytic. Choosing a proven, reliable and well designed catalytic woodstove can greatly reduce the need for service. The first thing to consider when evaluating a catalytic woodstove is the combustion design. Look at the location of the combustor in relationship to the flame path. Look to see if the combustor is mounted horizontally or vertically and also what material the combustor is made of. Consider what thoughts or measures were taken into consideration by the stove company to deal with overdrafting. Of course you can also call the two largest suppliers of combustors, Sud Chemie Inc. and Applied Ceramics and ask them about warranty concerns. Both of these fine companies track warranty returns from all the stove manufacturers. Last, consider if the stove was built around the combustor or was the stove first designed and built and then a combustor was added. Afterthoughts for emissions control are long-standing in our industry. Many of us remember the spaceship looking device call the IntensaFire. While the intentions were good, the flue temperatures never got hot enough to avoid the pitfalls associated with afterthought design. Solid performing catalytic woodstoves are designed to burn smoke from wood combustion, not burn wood and then deal with the smoke. Fundamentally, understand that large capacity, catalytic woodstoves are inherently designed for heating a home or large amounts of space. Well engineered models are not taxed in that effort and can handle the job. If a consumer purchases the wrong stove for their situation and tries to operate it in a manner other than as intended, the net result is consumer dissatisfaction and all sorts of complications for both catalytic and non-catalytic woodstoves. Combustor life span can vary based on several factors. Operating temperatures, fuel burned, stove design, contaminated fuel burned and total hours. Prior to replacement however, a thorough cleaning should be performed. Thorough cleaning may improve performance of a used combustor. As you can see by the chart above, thorough cleaning of the combustor helps to remove materials or debris on the surface areas of the combustors. By once again exposing these surface areas coated with the catalyst, activity remains and carbon monoxide levels are again reduced to zero once the combustor becomes active. 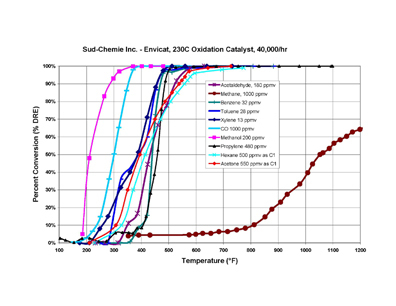 Extensive testing by Sud Chemie of an aged combustor from a catalytic stove has shown superb results. 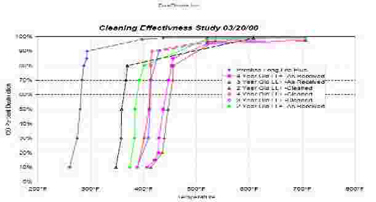 The chart below tracks the effectiveness of a 12-year old combustor versus the same test for a new combustor. As you can see, once the combustor reached a low “active” temperature, nearly 100% of the carbon monoxide is consumed by the combustor. These results and actual experience support the fact that a well engineered catalytic woodstove should be able to provide between 8-10 years of combustor service. Most carbon monoxide in the smoke is destroyed by catalytic combustion. Older combustors may require hotter temperatures to activate. When designing a catalytic woodstove, manufacturers have taken into account the need for replacement and making the task simple. The easier the task, the more likely the consumer will be proactive about maintenance. Design that allows easy access to the combustor and makes it possible to remove the combustor without any tools help greatly. A simple yet effective design also encourages a consumer to view or inspect their combustor, beyond just the indications provided by a catalytic thermometer. Replacement cost for a combustor can vary depending upon size and material, but the average combustor is $200. In some parts of the country that is equal to or less than a single cord of wood. In the early years of catalytic woodstoves, combustor replacement costs were higher than today due to a limited chain of distribution. In the past 20 plus years and with the advent of e-commerce, competition has increased resulting in decreased pricing and increased avenue of access. Combustors can now be purchased on eBay, CraigsList and from dozens of on-line resellers. They are also available through hearth retailers and OEM manufacturers. Ease of access and competitive pricing have served as inducement to keep efficient catalytic woodstoves working at peak performance. Annual sales figures are an indicator of on-going combustor replacement. There are several companies that manufacture, sell and distribute combustors, making it difficult to get comprehensive figures. However, sales figures provided for this summary were provided by the two leading combustor providers, nullifying the false understanding that catalytic woodstove owners do not replace their combustors. Education and learning experiences are critical. When catalytic combustors were introduced to motor vehicles in the mid-1970s, many vehicle owners inadvertently pumped leaded fuel into cars designed to run on unleaded gasoline, which resulted in damages to catalytic combustors located down stream in the exhaust system. This was a costly mistake that often required timely and expensive repairs. So, too, there was a learning curve with regard how to burn a catalytic woodstove. Homeowners who were accustomed to burning all sorts of debris and trash in their woodstoves soon learned of the consequences. More than 20 years later, catalytic woodstove manufacturers have educated retailers and in turn they have educated consumers on the proper method of responsible ownership of a catalytic woodstove. Measures include in-house and field training of all authorized retailers. The added benefit of experience and education at this level allows for a more complete education for the consumer. Owner/operator manuals packaged with each stove give explicit instructions on proper operation as well as inspecting and testing for combustor function. Catalytic combustor industry leaders, such as Sud Chemie, Condar Company, Applied Ceramics and others, provide superb education and technical advice, support and access to real experts. It is in the best interest of catalytic wood stove manufacturers and combustor manufacturers to provide the very best of education to dealers and consumers alike. Failure to do so would be very costly. That is why combustor manufacturers such as Sud Chemie and Applied Ceramics include expanded replacement and operating instructions on DVD with every combustor they ship. Their FirecatCombustors.com website provides educational video, live chat sessions with technicians and much more. The Environmental Protection Agency requires that each stove manufacturer provide a 6-year prorated warranty on original combustors. Depending upon stove design, combustors can last or remain effective as little as 2 years (burning seasons) or up to 10 years or more. Each combustor returned to the stove manufacturer is in turn shipped back to the original supplier for testing. Without question, although small in number, the vast majority of the combustors failed due to thermal shock. Thermal shock is generally the result of rapid temperature changes (such as loading hot stove full of snow or ice laden wood) or excessive draft. Less than .4% of all OEM combustors are replaced in the first three years of the warranty coverage. Less than 10% of all OEM combustors are replaced during the EPA mandated 6 year warranty. These figures are based upon data provided by OEM providers and resellers of combustors. Catalytic woodstoves excel where heating large amounts of space or continuous low burns are needed. Let’s assume for a moment there are two homes, located next to one another in the same community in a suburb. We will further assume that both homes have the same number of occupants, exact same floor plan and the residents in both homes desire the same indoor temperature during a cold winter day. Both homeowners also purchase their winter fuel from the same supplier on the same day from the same pile of cordwood. Both homeowners also expect their woodstove to be their main source of heat in their homes. In the first home we have a non-catalytic woodstove that is Washington State approved at a maximum 4.5 grams/hour and 75% efficiency. The neighbors’ home has a catalytic stove rated at 1.76 grams/hour and with an efficiency rating of 82.5%. It is obvious the catalytic model is much cleaner burning overall and is also much cleaner burning as discussed earlier, in the low and medium burn settings. The catalytic woodstove will therefore produce fewer emissions over the winter, but how much less? To reach the actual answer and to have a total appreciation for the performance of catalytic woodstoves, look at each of the stoves’ individual efficiencies. Remember, all factors in the scenario above were identical in every respect with the exception of the stove used in each home. The homeowner with the non-catalytic woodstove will actually burn more wood and produce greater levels of particulate over the same winter due to the 7% difference in efficiency. It isn’t enough to just look at grams of particulate produced each hour without taking into consideration overall efficiency. We all realize education is paramount to the success of our industry. Dealers need to make certain the customer has the right stove for their particular application. Stove manufacturers need to keep dealers apprised of all on-goings including technical updates, training materials and of course technical support. So the next time someone asks you about catalytic woodstoves, you can tell them they have come a long way. You can give them good solid advice based on the facts and in the end make certain the consumer receives ultimate satisfaction from their clean burning woodstove. The Chimney Sweep News is an independent trade journal for chimney professionals. Subscriptions to The Chimney Sweep News are available by calling 541-882-5196. Copyright © 2015, Jim Gillam. All Rights Reserved.